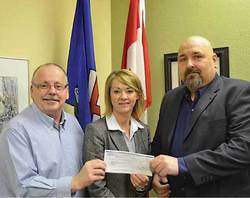 Mayor Don Faulkner (on left) and President of Calmar C.A.R.E.S (Cultural, Arts and Recreation Enhancement Society on right) Mr. Peter Popowich, are presented with a cheque for $21,500.00 from The Minister of Environment and Sustainable Resource Development, Diana McQueen. The money is from the C.I.P. (Community Initiatives Program ) and will be used to help fund the purchase and placement of an electronic message sign which will replace the community announcement sign on the east edge of Town adjacent to Highway 39.